A great awakening is taking place with the merging of the masculine and feminine. Ancient truths, secrets, hidden knowledge, and the Wisdom of the Ages are waiting to be revealed. Through the ancient mists of time, I like many sisters of the Rose have carried a secret from our ancient lineages since Atlantian times…. Founder and messenger of the sacred work of the Black Rose and a keeper of the Wisdom Flame of the Diamond Black Light, I have heard and felt an unseen energy. Through a recent traumatic experience I asked for peace. I received it through dreams and the beautiful energies of a sacred site. Sounds of ancient songs and voices were whispering and emerging….so I must dare to speak the language of ancient tongues and ancient voices. From the Holy Queen of Nobility….to the Divine Mother of sorrows….from the nuns, monks and Druids of ancient monasteries and Temples….to the Queen of Nature and the Stars…. From the Elemental messengers to the mournful sirens of the sea….from the Black Swans and Valkyries….to the Dragons of ancient ley-lines…. From Jerusalem to the Knights Templar’s….from the Heart of the Black Madonna, “The Lady of the Midnight Sun”…to the dark Light of the Earth and Cosmic Mother…. I have heard a call and been given a sacred mission…. And that sacred mission was to get a Black Rose to a certain destination. This is for the re-activating and strengthening of an Earth STARGATE crystalline grid to anchor the Ascension Rose Codes and higher Diamond Light octaves of Shamballa and new energies of the New Earth Star – for the energetic return of the Black Rose and the mystical Black Roses of Iona…. Iona is a sacred Holy Isle off the west coast of Scotland, a burial place of Kings, magic, primordial energy, stones and an unworldly peace surrounded by a turquoise sea, white sand and black mountains, and home to a ruined medieval Mary Nunnery and a restored Abbey with a St Michael Chapel. Ancient Celts described Iona as a place where the veil between Heaven and Earth is lifted. St Columba, a missionary exiled from Ireland, came to Iona in the year 563 in a small boat with twelve companions to build a monastery. Known as the Isle of Peace, of Dreams and of the Druids, Iona is an island of peace, of visions and of prophecy. It is a natural meeting place of Heaven and Earth, a place where life and death meet, of death and transformation. It is made up of the oldest rocks on Earth. Some say the Black Roses of Atlantis were a breakaway group from the Sisterhood of the Rose when Atlantis fell. We were not a breakaway group. We were exiled and cast out. We had the knowledge and wisdom and ability to repair the DNA and heal the emotional and physical body of unresolved emotional trauma through the ancient Rose Codes of universal Love frequency 528hz in the Well of Grief. We would not and could not share this wisdom with other sisters because our ancient healing powers were performed under the veil of darkness. “When the last Black Rose is in place, the Heart seed of the Black Rose will be activated”. Through my own dream time working within the healing Temple of the Divine Earth Mother and Diamond Black Light back in Atlantis, I understood what that message meant, for there is a deep connection with my Beloved Whitby in North Yorkshire and Iona not only as planetary chakras of Light for the Magdalenes, but in the healing of the suppression of the Divine Feminine and her unacknowledged grief held within the emotional wounds of the Heart. In the memories of those Black Rose sisters who had gone before, although Iona is now a symbolic centre for Scottish Christianity, there are also myths and Legends of Atlantis, of Egypt, of Knights Templars, of Druids, of Grail Legends – and a prophecy that foretells of the coming of a woman that will return to Iona with the soul of Mari Magdalena…. Iona is also an island that has known deep pain and suffering. Today, many pilgrims still go there today to grieve. Yet it is also a Gateway to the Other World that anchors Ley-lines whose alignment reaches to the east coast of Scotland at Montrose (Mount of the Rose). As part of the energetic return of the Black Rose, unable to physically travel to Iona myself, I asked a friend who I knew would be visiting the Isle if she would act as a guardian and take the precious cargo of a Black Rose to it’s destination with instructions of where to place it. So on the 18th August 2018, wrapped in the petals of the Mary Magdalene Rose that grows in my garden, a Black Rose was taken by my friend to a place where the Earth, sky and sea meet, and placed within a wall of the roofless ruined medieval nunnery. Open to the elements and locally referred to as eaglais dhubh “the black church”, it is so named because the medieval nuns wore black robes and followed the teaching of St. Augustine of Hippo, in Egypt. The last Prioress of the Nunnery Anna MacLean has on her tombstone an effigy of a woman and child with an inscribed dedication to “St Maria”. This woman is flanked by medieval symbols of twin towers that signify a reference to Mary Magdalene…. In my own dream time the black nuns have called to me and stepped forward from the shadows as they have a story to tell. It too is a story of Injustice. I often see them bent over and tending the white and red Roses in their garden. Whether fact, fiction, myth, fantasy, truth, legend or prophecy, listen to the voice of your own Heart and Soul, take what below resonates in your own beautiful Heart from this Isle of Dreams of what I have brought forth and birthed, and allow the rest to fall away…. Iona eons ago was a mystical place and became home for a very small, select group of Black Rose sisters and brothers who had suffered much loss and trauma at the fall of Atlantis, and Iona became a place of comfort and peace for their grieving and wounded Hearts. Emerging from chaos and trauma, these spiritual Black Rose Queens and Kings, wealthy in their own right, often misunderstood by their families yet who trusted in the power of Love, with Iona’s spiritual power, they had to painfully create their own community and society. Working with the mind, body and energy, my intuitive thoughts are they brought forth and set the foundations for the new knowledge of Celtic Alchemy that was to follow. Working with the White, Black and Red, they could communicate and work with the forces of nature and connect deeply into the Heart of Gaia to perform their holiest of holy rituals to the “Lady of the Midnight Sun” through the Language of Light and solfreggio frequencies of the Rose and Love frequency of 528HZ. After my own Mother’s passing In January 2018, prior to holding a sacred ceremony in honour of her, I was shown a vision of a funeral pyre surrounded by women. It is my belief I had somehow tapped into the Akashic records of an ancient ritual. And so the Black Roses lived out their lives in peace and solitude with Divinity and each other, performing high ancient funeral pyre rituals for their deceased brothers and sisters, and in preparation for their final journey flanked by radiant Angels along the “Street of the Dead”. Iona became the resting place of the Black Rose sisters and brothers who worked in service as Priestesses and an ancient Order of the Sisterhood of the Black Rose within the healing Temples of the Mother and the Crystalline Diamond Black Light in Atlantis. A sacred healing Temple and one of prophecy, they anchored the Codes of Light through chant and sacred ritual. Through the power of vision, they also expressed the Light of the Magda Flame through their Hearts – the Magdalene being an energy first made manifest in Atlantis. Holding the stones of Iona, the granite that shines like diamonds in the sun, the black slate that holds a multitude of rainbow coloured stars, and the prized green serpentines “Mermaids Tears” in their hands, these became the Record Keeper Stones for the future. Aroganite, found in the Mother of Pearl lining from pearl oyster shells found on the white sands, was placed on their third eye to assist in the transfiguring of their human form into a body of Light to become transmitters and bring down the Light of the higher realms to anchor into Mother Earth. Within the heightened energies of universal Love and electromagnetic frequencies, these Ancient Ones knew the power of and resonance of the sacred fire that rose from the depths of our Mother Earth, the Great Mother – later manifesting as a presence and archetype in medieval times as the Black Madonna. From the haunting sound of the wind, the roar of the sea below, and the ancient vibrations of Iona’s Holy Well of Eternal Youth, to the resonance of singing in the golden Light of Fingal’s Cave on Staffa, known for its natural acoustics and formed from hexagonal jointed basalt columns, they knew how to connect with the wisdom of their own souls and protect the Feminine in exile – for they knew only too well what it was like to be exiled and cast out from their community. There are also ancient Celtic myths that speak of Dun I as the “Hill of Angels”, and on the summer Solstice, the Goddess Brigid would visit Iona at midnight and bless the waters at the Well of Eternal Youth. There is so much more to share about the Black Roses and Iona and this page will be frequently updated. The Priestesses and Priests of old are resting and sleeping, suspended in animated suspension, as are the ancient Kings, Queens and Knights….waiting for the time to return and take up arms again, and share a very important message. To stay updated and receive information about the Black Rose, the union of the masculine and feminine and the shadow and Light within, I invite you to sign up to receive the blog by using the Contact Page above. My deep heartfelt gratitude to Rebecca Greesham for her help and inspiration, a dear Rose sister who when I shared with her that I had received a nudge to take a Black Rose to Iona, shared information with me about Anna Maclean and the nunnery that unlocked a key within me to make all this happen. Bless you and thank you beautiful one! Deep gratitude also to my friend Jackie Dunn, who carried the precious cargo of a Black Rose wrapped in a cut flower of the Magdalene Rose to Iona. 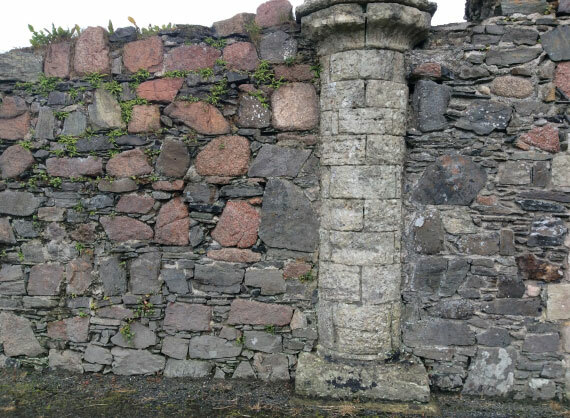 And many thanks for the photo you took of the nunnery wall and for the stones! Deepest gratitude also to Mark Sparham, a friend, brother and Guardian of the Rose, whom on the 3rd July 2017 I had entrusted with a sacred mission. He safely delivered the precious cargo of a Black Rose wrapped in a Rose petal of the Magdalene Rose, and placed it at the feet of the Black Madonna in the underground Crypt at Chartres Cathedral. Since my own dreaming of the the energetic return of the Black Rose sisters and brothers, Rebecca Greesham sent me an article “Iona – Island of Druids by Maia Christianne of Spirit Mythos”…confirmation for me I have not made this stuff up!